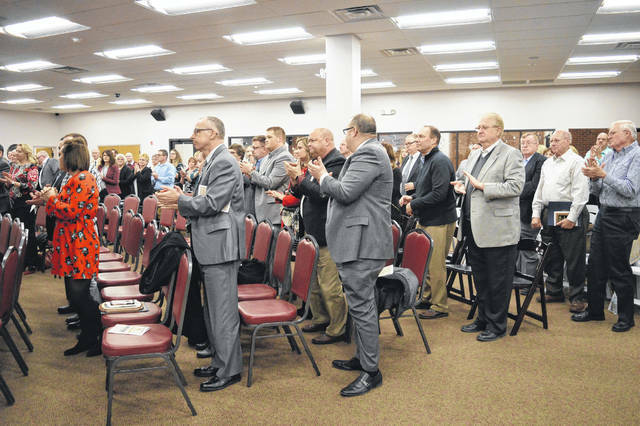 Members of the audience during the 81st annual Gallia Chamber of Commerce Awards Ceremony held a standing ovation in honor of Chester Mike Polcyn who was posthumously awarded the Bud and Donna McGhee Award. Chester Mike Polcyn served as the Gallipolis City Park Santa for over 40 years. Polcyn passed away Wednesday and was then honored as the Gallia Chamber of Commerce’s posthumous Bud and Donna McGhee Award recipient for his years of service to the community. GALLIPOLIS — Chester Mike Polcyn, commonly known as the Gallipolis City Park Santa, was posthumously awarded the Gallia Chamber of Commerce’s highest honor, the Bud and Donna McGhee Award, Thursday night during the 81st Gallia Chamber of Commerce Awards Ceremony. 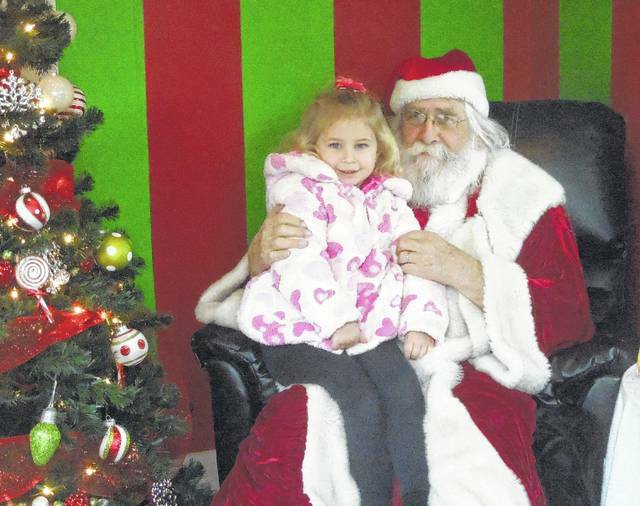 Polcyn died Wednesday after serving more than 40 years as the community’s personal Santa Claus, greeting generations of families in the Santa House in the park, the Gallipolis Christmas Parade and public functions throughout Gallia. Campbell lauded Polcyn’s presence in the community for his decades of service to the community, beloved by children and adults. Polcyn first became Santa Claus when his first-born was in kindergarten and the school PTO needed a seasonal symbol to hand out Christmas treats. According to Campbell, the following year, Polcyn embraced his role as Santa by growing a beard and wearing a custom Santa outfit. Polcyn suffered a broken leg in 2016 and retired from his role as Santa. Polcyn served on the Gallia County Local Schools Board of Education for 11 years and received multiple awards from various educational and youth-centered organizations throughout his life. He received a commendation from the Gallia County Commissioners. He is remembered as a U.S. Air Force veteran, a 4-H adviser and member of Calvary Christian Church. Polcyn worked with AT&T for 30 years, along with Ohio Bell and Ameritech. Polcyn long credited his wife of 53 years, Karen, for her support in his role as Saint Nicholas. She survives him along with their three children, Michael Shannon (Leah) Polcyn, Kari Lynn LaBello and John Mark (Jennifer) Polcyn, and Chester’s grandchildren and a great-grandchild. He is also survived by other family and friends. Chester’s obituary appears inside this edition of the Gallipolis Daily Tribune.